Plot Outline: After receiving the healing powers from a magical flower, the baby Princess Rapunzel is kidnapped from the palace in the middle of the night by Mother Gothel. Mother Gothel knows that the flower's magical powers are now growing within the golden hair of Rapunzel, and to stay young, she must lock Rapunzel in her hidden tower. Rapunzel is now a teenager and her hair has grown to a length of 70-feet. The beautiful Rapunzel has been in the tower her entire life, and she is curious of the outside world. 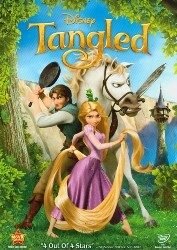 One day, the bandit Flynn Ryder scales the tower and is taken captive by Rapunzel. Rapunzel strikes a deal with the charming thief to act as her guide to travel to the place where the floating lights come from that she has seen every year on her birthday. Rapunzel is about to have the most exciting and magnificent journey of her life.